The 550-sheet tray supports A4, A5, JIS B5, Folio, Letter, Legal, Executive and Oficio sizes. 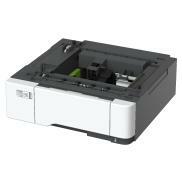 Paper (16 to 47 lb, 60 to 176 gsm) and card stock may be used from this unit. The 100-sheet Multipurpose Feeder (MPF) supports A4, A5, A6, JIS B5, Folio, Letter, Legal, Executive, Statement and Oficio sizes and 7¾, 9, 10, DL, C5, B5 and Monarch envelope sizes. Paper, paper labels, envelopes, transparencies and card stock may be used from the MPF. The 100-sheet Multipurpose Feeder (MPF) supports A4, A5, A6, JIS B5, Folio, Letter, Legal, Executive, Statement and Oficio sizes and 7¾, 9, 10, DL, C5, B5 and Monarch envelope sizes. Paper, paper labels, envelopes, transparencies and card stock may be used from the MPF. Card Stock, Plain Paper, Transparencies, Envelopes, Refer to the Card Stock & Label Guide.